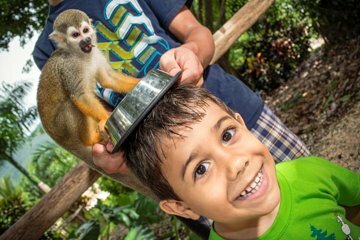 Osserva le scimmie scoiattolo in questo viaggio a Monkeyland, nel profondo della giungla della Repubblica Dominicana. Con questo tour di 5 ore fai un giro in un furgone attraverso le piantagioni locali di caffè e cacao e poi visita il santuario della scimmia e i suoi giardini botanici. Conoscerai i metodi di coltivazione biologica degli agricoltori locali, assaggerai frutta tropicale appena raccolta e guarderai e darai da mangiare alle 20 scimmie che sono state allevate per stare a loro agio a contatto con le persone. Il trasporto di andata e ritorno dall'hotel a Punta Cana e Bavaro è incluso. Un veicolo stile safari dai colori vivaci ti verrà a prendere la mattina presto presso il tuo hotel a Bavaro o a Punta Cana. Conosci la guida locale durante il tragitto verso una tipica piantagione domenicana. Incontra gli agricoltori locali e conosci i loro metodi di produzione biologica, usati per coltivare cannella, cacao, caffè e vaniglia. Assaggia la frutta tropicale appena raccolta dall'albero e approfitta dell'opportunità di acquistare alcuni di questi prodotti presi direttamente dal luogo d'origine per portarli a casa. Sali a bordo della jeep e percorri una strada di montagna nel profondo della giungla. Arriva al Monkeyland, un habitat per scimmie scoiattolo di 2 ettari gestito da una coppia premurosa. Segui la guida in un tour del santuario di 45 minuti, dove avrai la possibilità di guardare e dar da mangiare alle scimmie. Visita il giardino botanico, che ospita alberi, piante e fiori autoctoni, prima di salire a bordo di una jeep per il trasporto di ritorno al tuo hotel alla fine del tour di 5 ore. They really need to make the time spent with Monkeys longer. It felt rushed but it was an amazing experience. My three teenage boys and I went on this adventure. Not one of us was disappointed! We loved the time we spent with the monkeys. Every person on the tour was able to experience these amazing little monkeys dropping on their head, crawling on their arms, and snuggling on their faces. One layer right on my son's head to eat it's sweet treat. Excellent time and would recommend to all families. The plantation tour was fun, we learned about coffee bean and cocoa processing. Definitely worth the money spent! Book through Viator! Tried to book with other tour guide online and had nothing but hassles! This adventure was a surprise for our daughter Monkey Girl she loved every moment she got to spend with these adorable little monkeys. 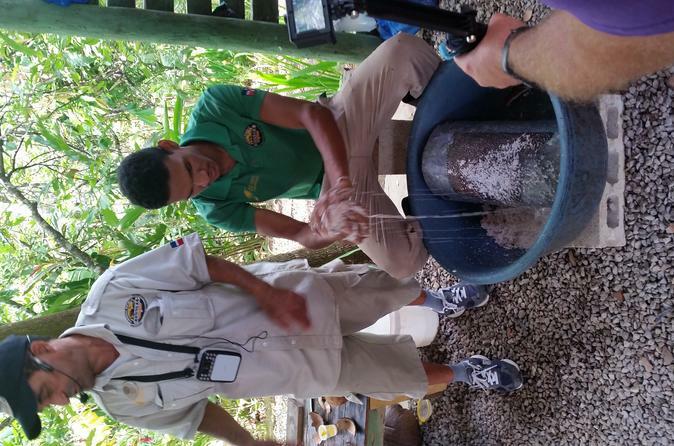 And of coarse learning and seeing how the coffee and cacao is processed was interesting. Special Thanks to our driver Rodolfo and our very funny guide PJ! Monkeyland was the highlight of our trip. We enjoyed seeing the countryside and learn more about the culture of Dominicana. The monkeys were absolutely amazing and friendly, it was an exciting adventure. Philip and PJ were wonderful tour guides. PJ was hysterically funny and great with everyone. Philip obviously cares greatly about the monkeys and takes good care of them. The habitat was a wonderful place for the monkeys to thrive. The monkeys are fantastic. Well worth the price. The plantation tour was mildly interesting. Our tour guide Rafael was great and knowledgeable. Only downside was the long drive. Lots of highway, and then when it gets scenic you are in an enclosed bus with no opportunities for photographs even though the description says the scenic tour is by open air bus. We did end up on an open air bus but only when we switched to it at a gas station after we had left the scenic region. So the open air was only on the highway at high speeds. Monkeyland was a lot of fun! It ended up raining while we were on the way took about 45 minutes to an hour to get there so we did the plantation safari part first so we wouldn't get totally soaked. Parts of it were outside, but underneath different areas where they show you how cocoa and coffee are prepared. I think people were bummed out b/c it was raining and didn't want to get wet and just really wanted to see the monkeys. An hour later, it cleared up and we traveled 5 minutes from the plantation to see the monkeys. They were really cute and friendly especially when the food bowls appeared. Our guide was Philip sorry if I misspelled and he was really good and got some nice pictures of my husband and I with the monkeys sitting on our heads! We had such an amazing time feeding the monkeys and visiting Annas house. We were able to see breathtaking views of the mountains and see the crew roast cocoa beans and coffee beans and sample some coffe and hot chocolate from thier harvest. Im not gonna lie, my mom was the one that wanted to do this tour and we thought it was going to be cheesy but this was one of most favorite days in DR! Thank you to the crew for a wonderful experience! Great trip! Monkeys are very friendly. Even my wife, who first thought she would be spooked thought it was fun when they scampered over your head from one person to the next. The monkey's faces look like little humans. The open air truck ride thorough the country side was pleasant. One of the better roads the we traveled in the D.R.